I know that I've mentioned before the notion that as we wind our way through the city from one place to another, we tend to take routes that have some kind of emotional resonance for us. I came across the idea in a novel, but try as I might I can't quite find the title or the author. As I've moved into another year of blogging, I've realised that there is not only a certain cycle to what I do - sowing, planting, walking, eating - but also to the places I choose to go, visit and see, and the paths I take to get there. Some of these are everyday journeys - to my mum's, or work - and others are simply places that I want to visit again. This wall is at the bottom of the chalk cliffs on the walk between Broadstairs and Margate, a location well documented in snapshots taken years ago on one of our seaside outings. I had quite forgotten about it until one of the pictures turned up last week. Colette recounts the story of her brother's going back to hear the sound of a gate creaking only to find to his disappointment that it has been oiled and the notes lost . 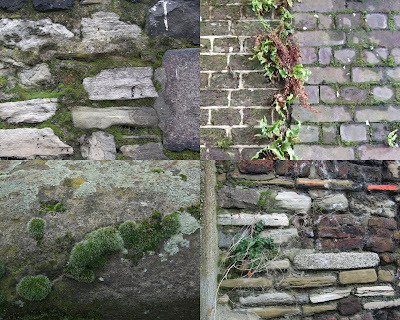 I went back once to capture the scent of a stone ledge opposite the block of flats we used to live in. In the sun it used to give off a dusty, baked smell. The ledge was there, but the scent gone. So I've decided that I'm going to have to make a bit more effort. Take in some new places, find some new paths, create some new ones. Should be fun. Lovely photos, and lovely sentiments. I look forward to seeing what you find! I know what you are saying about new paths, but I do find something pleasingly cummulative about the layered narratives and memories of walking the same paths over and over again (perhaps like Dorothy Wordsworth). Just like you with walls, I have found that concrete has a bizarrely Proustian effect on me. When I lived in Sheffield, I felt a peculiarly emotive connection to a particular spot on a particular rather run-down street. For ages, I couldn't fathom it, then later realised it was because of the *precise* shape of the concrete moulding that had been used to form the edge of the pavement - exactly the same kind of concrete on a familiar Rochdale street from my childhood.